Paso San Carlos: National Monument? Several years ago, on my first trip down the entire length of southern Chile’s spectacular Carretera Austral, or Southern Highway -- a 1240-kilometer journey from Puerto Montt to Villa O’Higgins -- on the return trip northward I had one of my most memorable adventures as a journalist. The sight of any soaring bird - an eagle, hawk, or even a gull - is a special thrill that always stops me in my tracks. 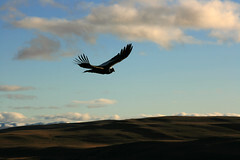 The hope that I might see an Andean condor, the largest flying land bird in the Western Hemisphere, was a major incentive for my travels to Patagonia. In North American, the condor was nearly extinct by 1964. Our forefathers murdered them wholesale, out of sheer whimsy, or the mistaken thought that condors killed livestock. The only use of a dead condor, that I've heard of, were the quills of the large feathers that miners collected for stashing their gold dust. Recently, the Quicksilver company made a generous donation to our Kickstarter campaign, and we are now more than one-third of the way to our goal of $15,000 by October 6. Still, Kickstarter is all or nothing: if we don't receive the necessary pledges to meet that goal, we do not receive any of the money raised through the campaign and your payment via the Kickstarter site will not be charged. If you've been on the fence, now is your chance to help support independent journalism about the Patagonia region of Chile and Argentina. A recent opinion piece in the Wall Street Journal about the controversial hydroelectric proposal in Chilean Patagonia called HidroAysén underscored several of the most common misconceptions about the project. The opinion piece gets its facts wrong on a few key areas: (1) HidroAysén is not the only way Chile can satisfy the growing demand for energy and be energy independent; (2) the “efficient design” of dams is not a sufficient justification for the huge and irreversible impacts they would have on Chilean Patagonia; (3) HidroAysén is a costly project that would not help raise Chileans out of poverty, but instead would expropriate some of Chile’s national treasures for profit; and (4) opposition to HidroAysén is the majority view in Chile, uniting conservatives, liberals, Santiago residents and Patagonians alike. Beginning with the “crazy” idea of a small conservation group, the campaign Patagonia Without Dams has snowballed into one of the greatest environmental movements in history. Here we have before our eyes, shamelessly, the Chilean neoliberal model in all its pride and arrogance, which has recently dispatched almost simultaneously two central issues regarding the environmental and social future of this region.